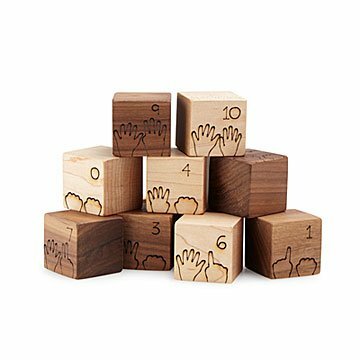 These adorable maple and walnut blocks teach little ones how to count with their fingers. Before they can talk, kids use their adorable, miniature hands to communicate. Hands up: "Pick me up, please!" Rubbing eyes: "Is it nap time yet?" Help them learn to count their way with this set of sweet handmade blocks. Each side has the traditional number and an illustration of a hand holding up that number of fingers. As they play, they can mimic the blocks with their own hands. Gradually, they'll be able to connect the hand signals with words, and voila! They'll be solving algebra equations in no time. Or maybe just counting to ten. Crafted from walnut and maple; sealed with jojoba and beeswax. Handmade by Adrienne and David Minnery in Seattle, Washington. Adrienne and David Minnery believe that the best toys spark imagination and are simple and durable. They started their design business because they wanted to make toys for their kids—and yours—that are natural and safe. Adrienne and David both have degrees in fine art, and have been creating since they could hold pencils. “It’s our comfort zone, and a natural way for us to express ourselves,” says David. Adrienne has been teaching art for more than 16 years. When she’s not in school, she’s devoted to developing new, creative pieces with David. With their two little ones by their side, the inspiring couple lives and works in Seattle, Washington. Can't wait to buy other sets!! These are the perfect size for little hands, but not too small that they can be swallowed. They are the perfect adaptation of how a young mind first learns numbers and how to count. This was a Christmas gift enjoyed by the recipient! I look forward to seeing my granddaughter learn with these. She is sick right now but seemed to like them despite feeling bad. Who doesn't use their fingers for counting, (especially when you're one or two)? These blocks are uncomplicated, just the right size for little hands and artistically perfect in my opinion. The pudgy little hands look just like my little toddlers' hands. We all love them - young and old. These counting blocks are adorable! Just the right size. Good interaction tool for teaching a young child. My granddaughter is just learning about counting. She loves blocks, so this is a great way to combine the two. The size is great for her small hands. This was a baby gift for a colleague. They were thrilled. So unique -- not a typical "store bought" gift! I work in education and what a unique way to teach a child numbers. Showed to many of my coworkers and everyone was so impressed. These are adorable! Would purchase again and again!